Often I find myself with topics that I want to discuss, trends that interest me, or products that I'm currently investigating, but none of them are 'big' enough to warrant a 'Weekly Review' post. If you've been reading my blog, you will know that not properly testing skincare products before reviewing them is a huge pet peeve of mine. It also slows down the pace of new content, because I have been limiting myself to just reviews after the product has been carefully tested over a long period of time, and the occasional skincare megapost. Well no more! I am going to start posting the random tidbits that catch my interest mid-week, and leave the giant posts where they are on the weekends. Total elapsed time: 12 days, which is extremely fast from Korea. It felt like forever when it was in that limbo between Incheon and California, but packages can take 5-8 weeks normally so this is lightening fast especially for free shipping. 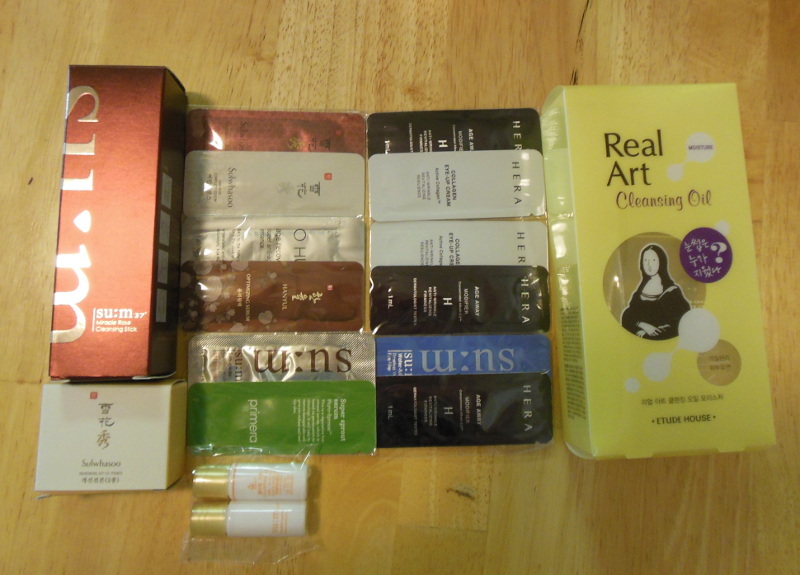 I will eventually be uploading an actual haul post featuring all the products from the various vendors I have been purchasing from in the last month, but this order was so special I had to hurriedly snap a picture before heading to work. Why? The samples. The samples. We'll get to that in a minute. Lately I have become a convert to the PH-conscious philosophy of skincare, which I plan to megapost about later when I finish testing some products and have some resources in place. The short version is, science says that cleansers with a PH that is close to your skin's is better for you. The Su:m37 Miracle Rose Cleansing Stick is a confirmed PH-friendly cleanser which has become so popular the brand had to permanently discontinue it because the specific rose extract they use isn't available in large enough supply to continue making the product. This has triggered a buying frenzy of all remaining stock, so it's a miracle I even managed to get one. Ok, I admit I bought this because I wanted free shipping and because I was flailing to get my order in before Avecko ran out of stock, which happened immediately after I placed my order so I may have literally gotten the last one. However, I purchased it because I am currently a fan of the double cleansing method, which requires 2 very gentle cleansers. One oil cleanser to break down your makeup and especially sunscreen, followed by a gentle foaming one to clean off the oil residue and actually clean your skin. The only cleansing oil I had is the Holika Holika Soda Pore Cleansing BB Deep Cleansing Oil (reviewed) which, as the name suggests, is not really meant for daily gentle cleansing. It's meant to blast crud out of your pores, and I use it 1x or 2x a month-- it's not a frequent thing. Since adding an AHA serum to my routine, my skin is a lot smoother and more delicate, so the Holika Holika pore obliteration oil needs to be retired in favor of something gentle. I wanted this oil in particular because it won the "Blind Test" on Get It Beauty (link to Blind Test segment, link to episode product list on their site) which is Korea's hugely popular beauty show. One of the key segments is the "Blind Test" where the top 5 products in a category (i.e. the best pink lipstick) are tested by experts (including dermatologists who test with fancy looking equipment, and famous professional makeup artists), by online followers, and by the audience of 'Better Girls' who are present for the show. The testing is usually quite thorough, and it ignores the price and origin of the product that 'wins'. This cleansing oil does come in two other varieties: "Light" and "Fresh", but this one is recommended for dry skin and is supposedly the most gentle. First, I was totally impressed with the amount of samples Avecko gave me for just a 2 item order, and both impressed and dismayed that they were all 'prestige' brands that I have been deliberately avoiding trying because they're so expensive. Part of the reason I love Korean skincare so much is that it's so cheap compared to the quality you get, but there is nothing cheap about a $104 serum. I am scared to try these in case I can't live without them, but how can I resist this free golden opportunity? If you do want to try out prestige products but choke at the price, consider getting them in sample sizes and decant it into a pretty jar if you must, or sacrifice the luxe packaging for the hygiene of using small amounts straight from the packet. Take The History of Whoo's Qi & Jin Essence. It runs around $104 for 45 ml. That works out to about $2.31 per ml. That works out to about $0.25 per ml. If you were to get 45ml worth in sample sizes, which is the quantity of a full size bottle, it would cost you $11.25. Obviously you have to buy it in increments of 10, so round it up to 5 orders of 10 packets at 1ml each: 50ml for $12.50. Compare $12.50 for 50ml to $104 for 45ml. Yes, you won't get the ~luxe experience~ of the packaging, which is absolutely gorgeous, but that's a hell of a deal and there's no glass bottle to accidentally break and ruin your $100+ product. And uh, I am going to stop there before I drown in waves of blogging guilt. There are many more I haven't listed. Oh my. Well, if there's a specific product in that list that you want to move to the top of the heap, leave me a comment below, or message me on Facebook or Twitter. Oh my goodness all those samples! I know these samples are off the chain! Talk about a way to make you stand out from other sellers! If I ever move to a place that has a real vanity or safe spot for beauty products (my tiny counter is an overcrowded obstacle course) I am absolutely going to indulge in some pretty antique cosmetic jars to decant my ultra luxurious samples into.